Our motto: "A cheap vacation doesn't have to feel cheap!" Ideal for families, active travelers and golf and dive enthusiasts, this appealing oceanfront resort offers the perfect combination of relaxation and fun. Snorkel amidst the colorful undersea world of coral reefs offshore, dine at a selection of international restaurants, play a round of golf on the challenging 09-hole course, try your luck at the 24-hour Barceló Bávaro Casino and enjoy kid-friendly amenities including a supervised kids activities club and playground. With daily and nightly entertainment and a wide variety of dynamic amenities and services to choose from, this enjoyable resort offers a great setting for unforgettable island escapes. Description of Business Center: Convention center with business center, 23 meeting rooms with Wi-Fi, Capacity up to 5000 persons. * A credit card imprint or cash deposit is required at time of check-in for telephone and incidental charges. *While this hotel strongly discourages spring breakers, it cannot guarantee a spring-break-free environment. * A price may display when children stay free, if your vacation includes transfers to your hotel. * Included in vacation price. * Minimum check in age is 18 year round. Ten great all-inclusive restaurants to choose from. All the restaurants in the resort mean unbeatable gourmet experiences. You will enjoy great food from different parts of the world. From the Japanese minimalist tradition through the exciting colours and flavours of Mexico to the fine delicacies of French cuisine and, of course, Spanish or Italian gastronomy, plus the special atmosphere and fun of a steak house. 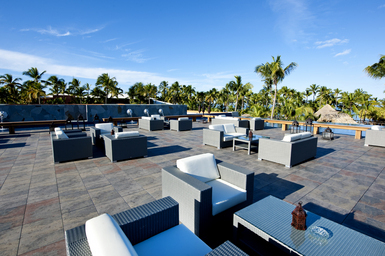 In sum, there are no similar dining choices to those in the Barceló Bávaro Beach Resort in the Caribbean. A charming French restaurant drawing inspiration from the late-eighteenth-century puppet theatres in Lyon. You can try the romantic flavours of French cuisine and choose your wine from a long list. The atmosphere resembles that of The Academy Awards ceremony: red carpet, lights and posters of all-time movies for a fabulous Italian restaurant. Sophia Loren, Anita Ekberg and many other movie stars look at guests from the walls of this high-end à-la-carte restaurant. Enjoy the best food in the world at the Spanish restaurant in our resort. Meat or fish with delicious vegetables to choose from a large and varied menu. The bar offers a fresher ambience, delicious tapas, and an impressive wine selection. At Kyoto we offer the best of contemporary Asian fusion cuisine. We use the best products available in the market to prepare fresh food. You can dine with your partner or friends at amazing teppanyaki tables for groups. Kyoto features an innovative contemporary décor and has a wonderful Zen garden at the entrance. Surrender to the exquisite flavours and smells of a host of typical Mexican dishes. Original recipes from every region in the country and the colours of the Mexican flag in the restaurant’s décor. 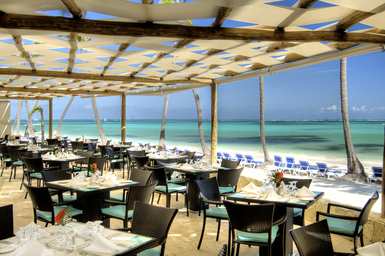 All guests staying at the Barceló Bávaro Palace Deluxe have unrestricted access to all its restaurants. However, reservations are required in à-la-carte restaurants. 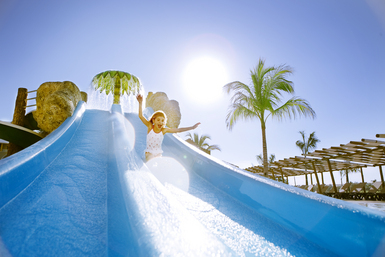 Guests can plunge into the endless swimming pools while relaxing and having fun: pool beds, water jets, and more. 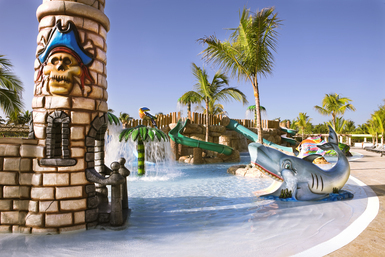 At the new Barcy Water Park, children can have a wonderful time with their parents and meet new friends. 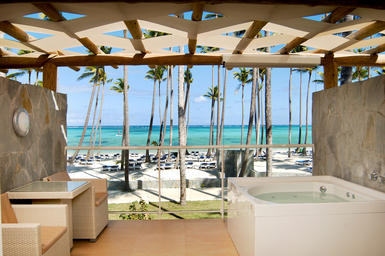 A matchless spa experience in Punta Cana in a space affording stunning views of the ocean. Amazing nightclub with DJ sessions, a wealth of cocktail drinks, and a VIP area on the second floor. The most spectacular theatre in the Caribbean. 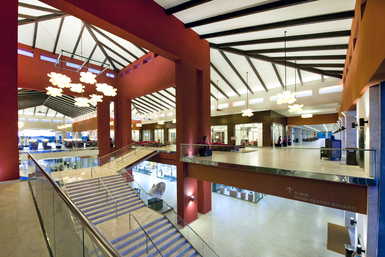 Las Vegas-inspired décor and capacity for 1,300 people. Clothing, jewels, arts & crafts… You can buy anything you want on relaxed shopping sprees. 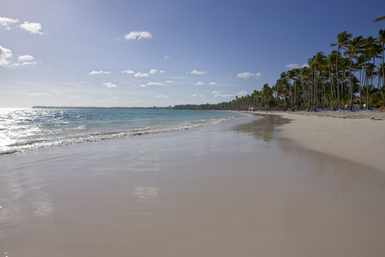 Travel comfortably and for free across the Barceló Bávaro Beach Resort on our train. A wide range of wedding packages including spectacular ceremonies at the jetty with the Caribbean as a backdrop, traditional Caribbean ceremonies on the fine, white sand amidst coconut palms swaying in the breeze, or more traditional events at San Salvador’s Chapel. After the ceremony, a wedding reception that the bridal couple and their guests will never forget. Day and evening activities available for adults and children. Just getting back to work but wanted to let you know that it was wonderful! Thank you for your excellent service and recommendations. It was totally stress free and a wonderful property to visit. I wanted you to know that it was perfect. All of our trips booked through you have been great and without any issues. We did one excursion to Isla Soana and it was great! Perfect weather and great food too. Keep us in mind for next year, we start looking in October. We had a great time and the views and settings can't be beat! The resort was extremely nice and pristine. The staff worked tirelessly to maintain it and it really showed. 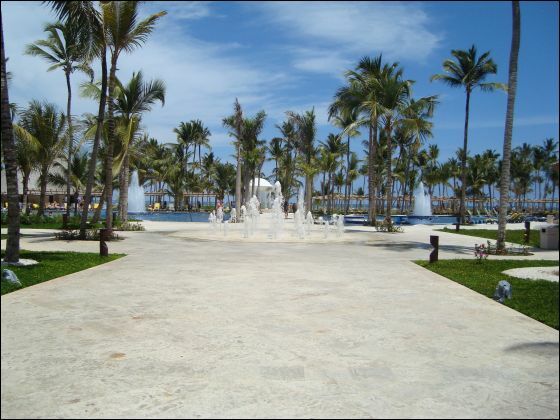 Compared to the all inclusive resort in Cozumel from a few years ago, Barcelo had many more amenities and activities and the food was a lot better with many more choices. We did feel that Barcelo felt a little more commercialized and not as personal as Cozumel though as we did not get to know anybody like we did in Mexico. The only frustration/problem we had was checking in and checking out. Once you are in the resort, everything is great, but getting in and out is very difficult. There front desk is understaffed and extremely unorganized and we watched person after person get very frustrated with them and it took us over 30 minutes just to check out to leave. It is also definitely true that the staff does not speak english; those that say they do really don't or very minimally. For us it wasn't a problem because Corey's spanish is very good but there were several American's that had issues because they were expecting them to speak english but if you knew that up front it would be fine. We had a great time and are ready for our next vacation! It most likely will be somewhere new but I would recommend Barcelo to my friends. I attached a couple pictures. Thanks for all your help! The flights: Perfect! On time both ways!! Wonderful! Transfers: Very easy. Everything went smoothly and on time going to and from hotel. Beach: Beautiful. Very well taken care of each morning. Pool: Outstanding. Many pools with something to do for all and for all ages. Service: The service at the hotel was excellent. There was a little bit of a language barrier, but that was ok and expected. Food: The buffet for breakfast and lunch had excellent choices and varieties – well maintained and beautiful presentations. The themed restaurants were fun and the meals – every course- beautifully presented. The food was very good. Rooms: Spacious and beautiful. Absolutely no complaints. It was very nice. The whole hotel was spacious and beautiful. Entertainment: This was very nice. The “Showroom” was huge and beautiful. It was nicely set up and the service was great. 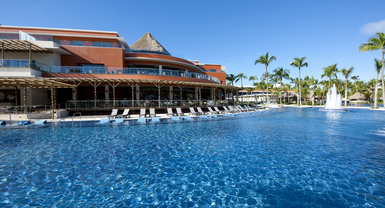 Would you return: Yes….if we ever go to Punta Cana again, I would return to that hotel. Would you recommend this resort? Yes. There was something there for everyone. We saw people of all ages – babies to elders! Your Service was Very accommodating and helpful – thankful to you for all of your help! 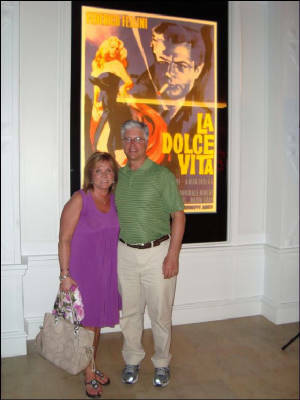 We did golf and go on a few excursions and those were so easily set up at the hotel. We have absolutely no complaints.